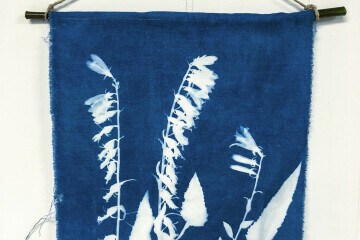 Cyanotype is a photographic printing process that produces a cyan-blue print through the use of two chemicals: ferric ammonium citrate and potassium ferricyanide. Once combined these chemicals become sensitive to UV light or sunlight. Once exposed, the process only requires water to develop and finish the print. The process was developed in 1842 by the English scientist and astronomer Sir John Herschel as a means of reproducing notes and diagrams. In more recent times engineers used the process as a cost-effective way to produce copies of drawings, known as blueprints. Today cyanotype artists blend old and new using digital cameras and inkjet printers instead of film and negatives to create an image. Owner and manager of Image Lab Photography in Bozeman, Zach graduated from MSU with a bachelor of arts in film and photography. Zach went on to achieve his masters of fine arts at Lesley University in Boston. His passion for photography, education, and exploration led him to start his work on what has now become the Image Lab.